As the blood returns to the heart passes through special thin-walled channels called veins. Unlike strong, tough arteries, these vessels are easily distended. You can demonstrate this by pressing your finger on a vein on back of your hand and watching it swells as the blood builds up behind it. Blood flowing from the head and upper chest flows downward toward the heart. On the other hand, blood coming from the lower extremities must flow upward. To make this possible, nature has provided valves in the veins so that the blood can only flow toward the heart, never in the other direction. In your legs you have two main sets of veins. The deeper veins are located within the muscles where they are given good support. But the veins on the surface just under the skin have little support and are easily damaged. These surface veins often subject to inflammation or phlebitis. In some people the veins in the legs are weak and may swell easily. This trouble seems to run in families. Then again anything that increase the pressure in the pelvis or abdomen may slow the flow of blood back to the heart from the lower extremities. One frequent cause of varicose veins is pregnancy, another is obesity. Anything that increase the pressure within the veins of the legs and thighs may weaken or break down the little valves, so that the veins become enlarged and the blood does not find it way back to the heart as it should. Varicose veins are ugly, and sometimes they are dangerous. A blood clot forming within a greatly dilated vein may break off and travel to the heart and lungs. This serious condition, known as pulmonary embolism, may actually cause death. Serious hemorrhage may occur if a large varicose vein is torn open or cut. Some people have actually bled to death, not knowing what to do in such an emergency. Steady pressure over bleeding point, as usually control the bleeding but one should avoid such a danger by having the vein properly treated or removed. 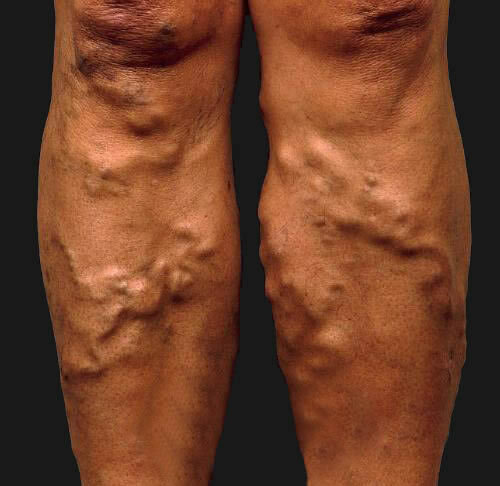 People with varicose veins first note swelling along the course of the veins, followed by muscle cramps and a tired feeling in the legs behind the knees. In some cases the skin over the lower part of the leg may break down, forming a large, ugly ulcer, which is often painful, especially when thrombophlebitis develops in the leg. 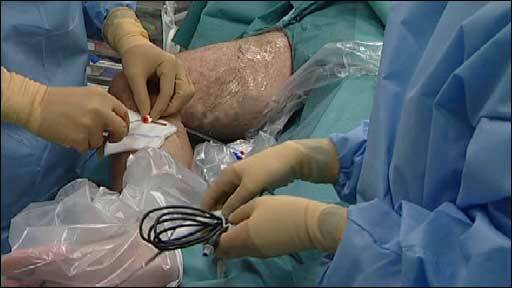 In most cases surgery is the best treatment, especially when the larger veins of the legs and thighs are involved. Long, tortuous, winding vessels can easily be removed by vein ligation and stripping. Smaller veins can often be successfully treated by injections, but surgery is best for large varicose veins. To avoid further trouble, one should not wear any elastic bands around the legs, for this will only increase the problem. Special stockings and elastic bondages are useful as a temporary treatment, but they are not comfortable enough for regular use over a long period. Varicose ulcers need special care. The patient should rest in bed, with the legs elevated so that the heel is higher that the knees. Antibiotic ointments are useful in treating the local cellulitis or inflammation. Also the heating cradle will help to protect the leg from further injury, and the gentle heat will help heal the skin. Some ulcers do better with moist heat, others with dry. Both methods may be tried. Keeping the leg elevated will reduce swelling by helping the blood return to the heart. Large, deep ulcers and badly scarred areas may need a graft of fresh skin over the area before they will heal completely.